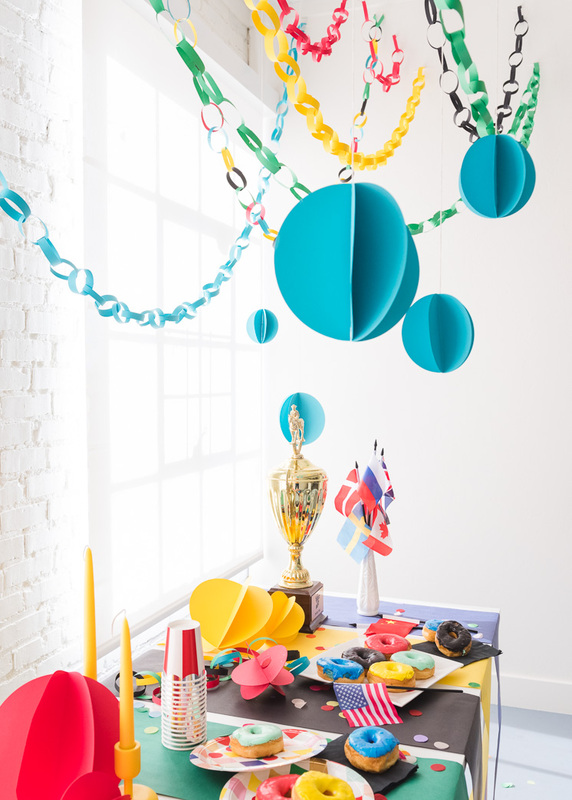 Start planning your Olympics Paper Chain Party with a few easy steps! Everyone knows I’m a huge proponent of a red lip. Maybe you’re having a bad hair day, maybe you’ve worn the same outfit three days in a row, but throw on a red lip, and NO one knows! Instant glamour. I highly recommend everyone investing in a signature red lipstick. Confession: I still have the red lipstick I wore for my engagement photos…8 years ago. Yikes! Now is the perfect time to invest because nothing says Valentines Day like a showstopper red lip! 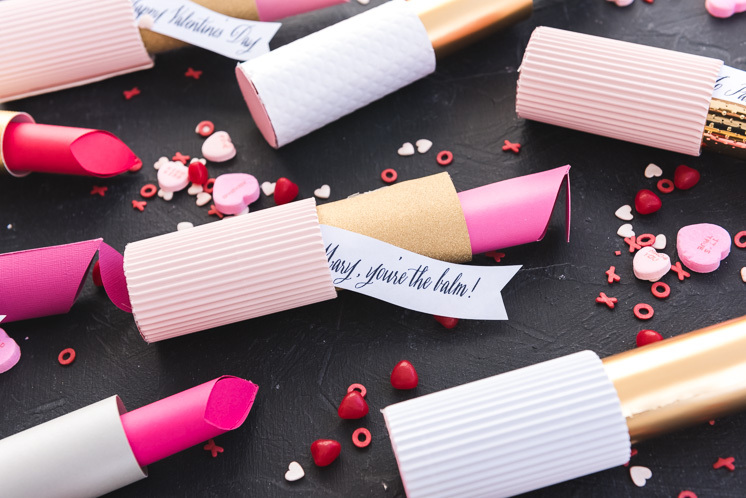 So in honor of our deep adoration of a bold lip we’ve created Paper Lipstick Valentines! These luxurious tubes are filled with sweet candies and made from a toilet paper roll! Talk about trash to treasure, right? 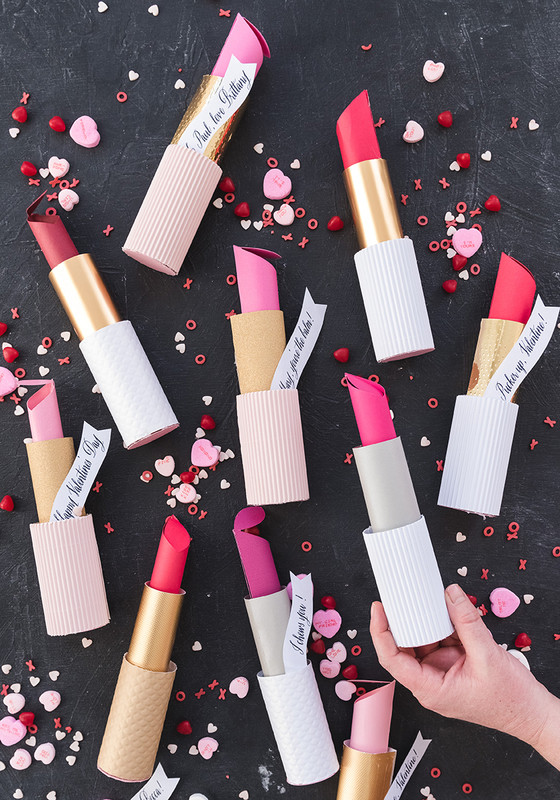 So even if you’re not quite ready to flaunt the red lip, these Lipstick Valentines are the perfect shade for everyone! Get the free printable templates (craft cutter ready!) after the jump! Just because we love oversized everything does not mean that we don’t appreciate the smaller things in life! These delicate DIY paper holly boughs by paper flower artist Tiffany Holloway of Nectar Hollow, are so realistic I had to make sure I wasn’t still dreaming of sugar plums and snowflakes. They are super versatile as well. 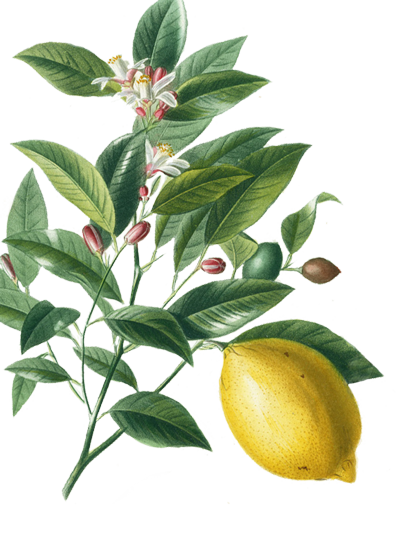 You could make an arrangement, incorporate them into a garland, stick them in a tree, or just dance around with one in each hand spreading Christmas cheer. I placed individual boughs in vintage glass bottles I found at a vintage store (for about a $1 a piece!) and placed them on my mantle at home. It’s my one Christmas decoration of the year and I love, love, love them! 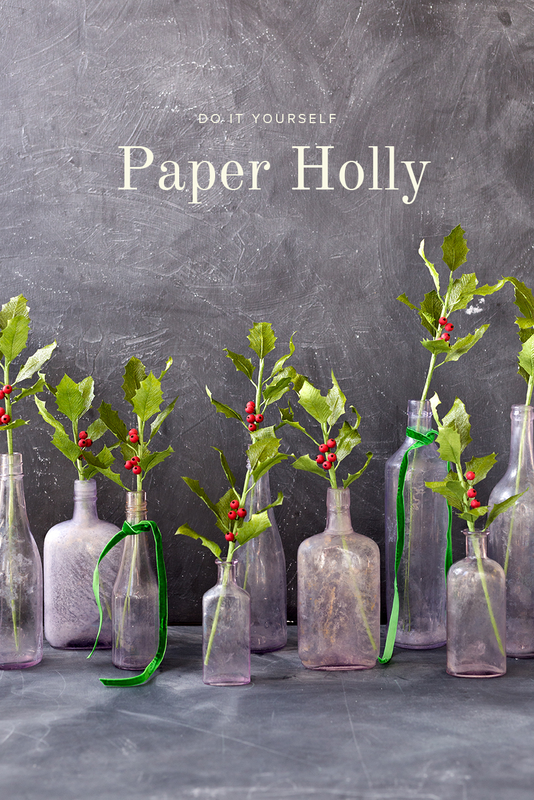 This DIY paper holly tutorial will take you step by step through the process and soon you’ll be up to your knees in this festive greenery. You know the scenes in the movie “Elf”, when Buddy stays up all night decorating the department store? Or when he does it again at his dad’s house? GENIUS. Well we decided to channel our inner Buddy the Elf and bring some Christmas cheer to the work place! 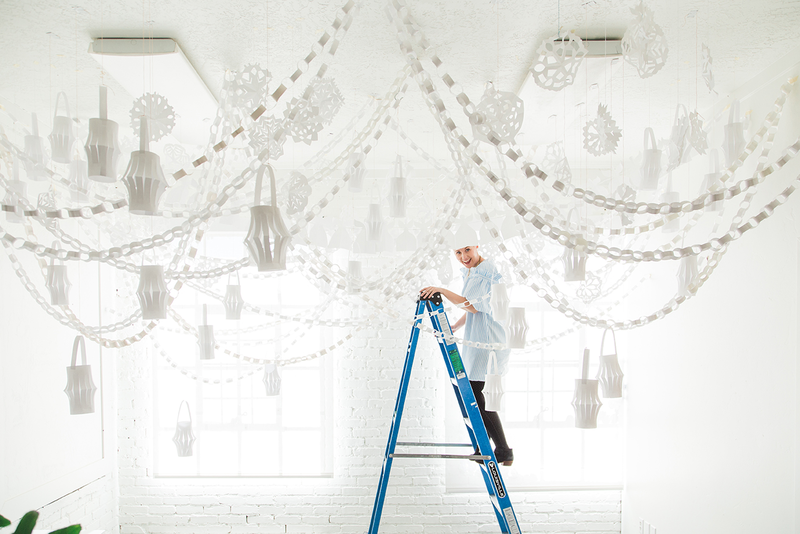 It just seems odd to us that the place where people are generally spending 8 hours of their day often gets neglected when it comes to holiday decor. So we’re making it super easy for you to remedy that trend ASAP. All you need is 1 ream of paper. It can’t get much easier than that! 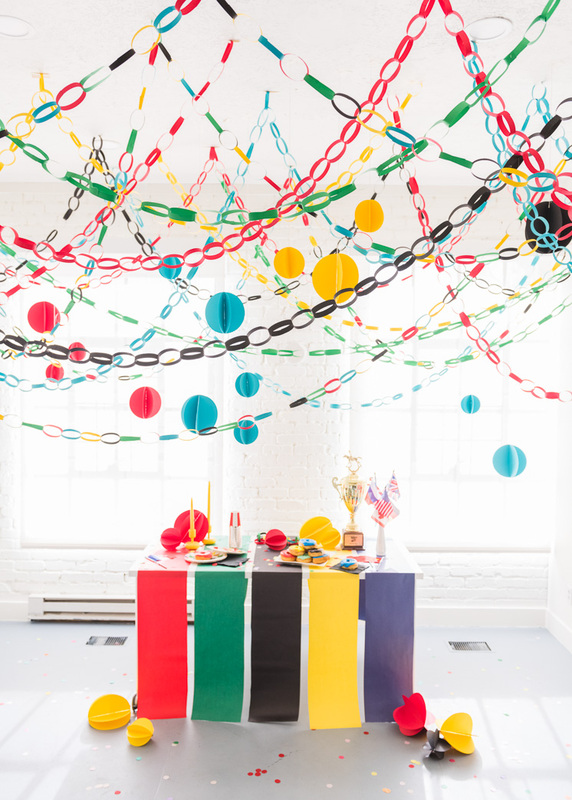 We covered our studio top to bottom in super simply paper crafts that you’ll remember making in Elementary school: Paper chains, lanterns, angels, and snowballs! Never mind the fact that it might be warm and sunny outside, because it will feel like the most magical winter wonderland inside! The key to the magic is to make a ton of paper decorations, so when we say a ream of paper, we mean the entire ream of paper! Don’t worry about doing it all in one night though, we don’t all have the skills that come from being raised by elves. Take a few nights to get in touch with your inner child and fill your floor with paper decorations! 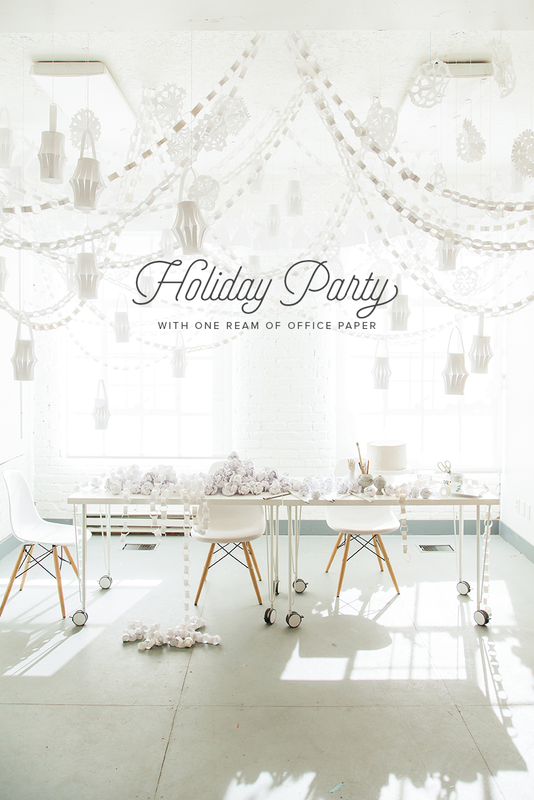 This would be perfect for an office holiday party, or even to surprise a coworker! If you haven’t gathered yet, we like pie over here. All the pies! The more the merrier! Unfortunately (or maybe fortunately? ), my eyes are often bigger than my stomach, which means there is almost always leftover pie on Thanksgiving. That poor forlorn pie, right? Well, we have the solution so no pie gets left behind! 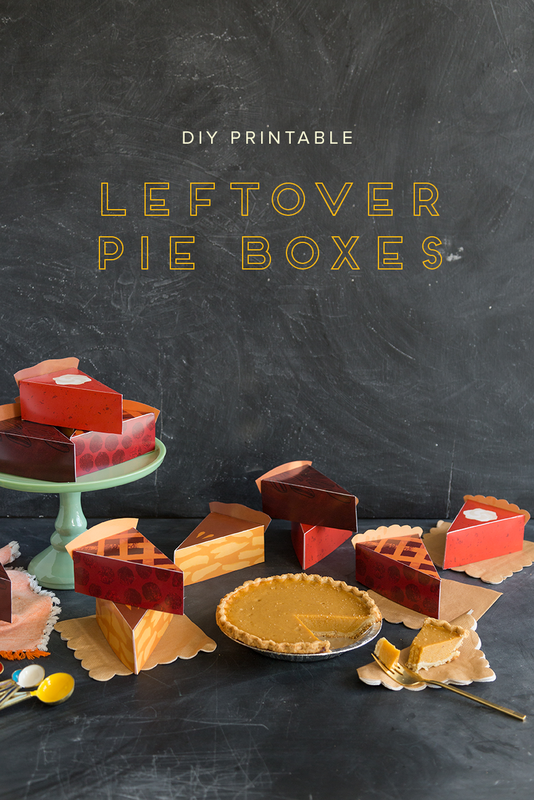 We created these DIY printable pie slice boxes for your thanksgiving festivities so you can easily take home those leftovers. Whether you use them as an adorable upgrade for tupperware, or as thank you gifts or favors following the feast, your guests will love these! Each box fits one slice, which might encourage portion control for some… As for me? It’s the perfect excuse to snag a few different flavors! Simply download the file and follow assembly instructions. There are designs for pumpkin, pecan, cherry, and apple. Let them eat pie!